1A growing share of blacks are completing high school and college, yet blacks lag behind whites in college completion. High school dropout rates reached an all-time low in 2014 for black students, and the high school completion gap between blacks and whites continues to narrow. In 2015, 93% of whites ages 25 and older had a high school diploma, compared with 88% of blacks the same age – only a 6-percentage-point difference, roughly half of what it was in 2000. The share of blacks ages 25 and older with at least a bachelor’s degree has also trended upward for several decades. In 2015, nearly a quarter of blacks ages 25 and older (23%) had at least a bachelor’s degree, compared with 36% of whites and 53% of Asians. 2The share of blacks in Congress is at an all-time high. The current Congress has the most black members in history, with a total of 50 between the two chambers (47 in the House, 3 in the Senate), or about 9%. (In comparison, blacks made up 13% of the U.S. population in 2015.) When the 92nd Congress took office in 1971, there were 13 black members (2%) – 12 representatives in the House and one senator. Today’s 115th Congress is the most racially and ethnically diverse overall as well: A total of 19% of members are nonwhite, including 34% of the freshman class. 3A growing share of the U.S. black population is foreign born. A steadily increasing proportion of the U.S. black population is foreign born, with a record 4 million black immigrants in 2015. Immigrants now make up 9% of the country’s black population, roughly triple the share in 1980. While black immigrants come from many places around the world, about half are from the Caribbean, with Jamaica and Haiti (17% each) the most frequent countries of origin. Yet recent growth in the black immigrant population has also come from African immigrants. Between 2000 and 2015, the number of black African immigrants living in the U.S. rose 174%. 4 Large gaps persist between blacks and whites on measures of wealth and income. Among blacks, the median household income was $44,100 in 2015, compared with $75,100 for whites. And among full- and part-time workers, the median hourly earnings of blacks were 75% of whites in 2015. 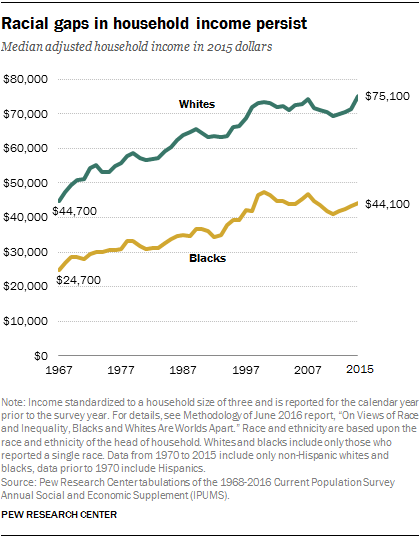 In terms of wealth, the median net worth of white households was roughly 13 times that of black households in 2013 ($144,200 for white households, $11,200 for black households). The poverty rate among blacks is the highest among major racial and ethnic groups, but it has declined over time, from 31.1% in 1976 to 24.1% in 2015, according to Census Bureau data. By comparison, the overall U.S. poverty rate has increased from 11.8% in 1976 to 13.5% in 2015. 5Blacks are the only major racial or ethnic group for whom Barack Obama’s election rivals 9/11 in historical significance. 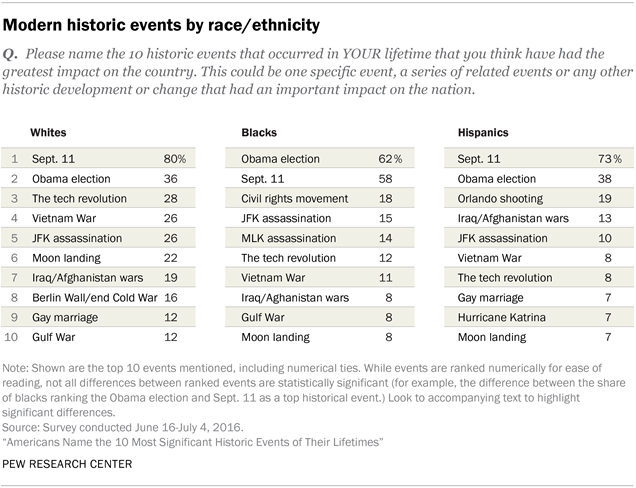 When asked to identify the top 10 historic events that occurred in their lifetimes, as many blacks named Obama’s election (roughly six-in-ten) as named Sept. 11, according to a 2016 Pew Research Center survey done in association with A+E Networks’ HISTORY. By comparison, just 38% of Hispanics and 36% of whites named Obama’s election among the top 10 most historic events. Blacks were also the only major racial or ethnic group to mention the civil rights movement (mentioned by 18% of blacks) in their top 10 historic events. Only 8% of whites cite the civil rights movement – and it fails to make their top 10 list. 6Only about a third of blacks say race relations in the U.S. are good. About six-in-ten blacks (61%) say race relations in the U.S. are generally bad, while just 34% say relations are generally good. 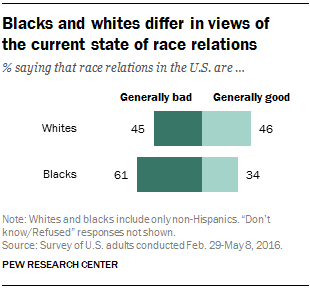 Whites are more split on the state of race relations in the country, with nearly equal shares saying relations are good (46%) as say they are bad (45%). About nine-in-ten (88%) blacks say the country needs to continue making changes to give blacks equal rights with whites, compared with 53% of whites. Immediately following the election of President Donald Trump, a far greater share of blacks (74%) than whites (43%) said they expected the election would lead to worse race relations. Note: This is an update of a post originally published Feb. 23, 2015. Anthony Cilluffo is a research assistant focusing on social and demographic trends at Pew Research Center.